The Institution of Engineers, Sri Lanka (IESL), the apex body for the engineering profession in the country, will commemorate the 102nd birth anniversary of the late Eng. B. D. Rampala with a memorial lecture at the IESL Headquarters at 120/15, Wijerama Mawatha, Colombo 7 today, November 14, 2012 at 5.15 pm. This year’s memorial lecture will be on ‘Engineering Transformation – The Role of Engineers in Transformation’. to be delivered by Eng. Mangala P. B. Yapa – Managing Director/CEO of Colombo Dockyard PLC. We are living in an era of rapid changes where technological breakthroughs from diverse fields and disciplines are being intelligently integrated to obtain sustainable synergies between flexible usage, comfort and security besides traditional features of energy efficiency, environment friendliness, etc. in goods and services. Solutions that change and adopt to the users comfort by being sensitive to real time changes in requirements of the consumer have led to the advent of route-optimized transport systems, system-optimized smart grids, consumption-optimized smart buildings, etc.. The common challenge to all professions is thus for practitioners to go beyond there respective boundaries in acquiring reasonable working skills on other disciplines as well for the proper utilization of such integrated systems. The engineering profession, in particular, is an all pervading profession. Its influence is felt in almost all spheres of human activity. Engineering systems, products and utilities have become so much part and parcel of everyday life that their interruption brings life as we have come to know almost to a grinding halt. Furthermore, user sophistication demands engineering techniques, materials, designs and controls being used be exponentially renewed to provide increased flexibility, comfort and security promised by new technology to people all over the world. It’s in this context that the theme of this years late Eng. B. D. Rapala Memorial Lecture ‘Engineering Transformation – The Role of Engineers in Transformation’ should be viewed in relation not only to rapid technology changes that are taking place but also to the transformation of the mindset of engineers in the country. Understanding engineering as a profession for improvement of the standard of living of the people, being receptive to change as an engine of improvement of standard of living of people, understanding of the interactions involved in bringing about successful change in keeping with modern aspirations of the people are among the many aspects that have to be dealt with on the subject. Sri Lanka has a proud engineering legacy in that great engineers in the past have already established the intellectual potentials of the country’s engineers. One such engineering who not only brought bold changes but also had foresight and determination to ensure their long-term sustainability is late Eng. B. D. Rampala who became the first native Chief Mechanical Engineer in 1949 of the then Ceylon Government Railways and went on to become its General Manager during the period 1955 – 1970. Born on November 14, 1910 in Pannipitiya Rukmale, he received his education at Nalanda College Colombo and Ananda College Colombo. Having completed his engineering apprenticeship in 1934 at Colombo University College, he joined Ratmalana Railway Mechanical Engineering Department of the then Ceylon Government Railway (present Sri Lanka Railway). He was appointed as Chief Mechanical Engineer of the Railways in 1949. Major railways around the world were upgrading from steam locomotives to diesel at this time and B.D Rampala lost no time in submitting his proposal to dieselize the Sri Lanka Railways, and in 1953, the first batch of diesel locomotives arrived from Brush Bagnall of the United Kingdom. More importantly he made immediate modifications to the locomotives when they developed problems in their introduction to existing conditions. 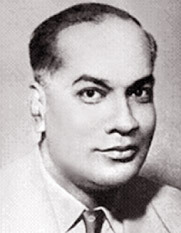 B.D Ramapla’s modifications won approval and praise from the British builders who later evaluated those modifications against their original design. He further submitted a paper on his observations to the Institution of Locomotive Engineers in London, which gave him full praise. Rampala was appointed as the General Manager of the Sri Lanka Railways in 1955. He is credited with the launching of express trains to major destinations within the country;named trains, like the Yal Devi, Udarata Menike Menike and Ruhunu Kumari. B.D. Rampala replaced the age old Lock and Block signalling system with an electronic colour signalling for the busiest portions of the railways in 1959. Train movements were thereafter controlled by a Centralized Traffic Control panel at Maradana, greatly improving safety. In 1956, the Institution of Locomotive Engineers in London commended Rampala as the Best Diesel Engineer in Asia. His demise on June 20, 1994 at the age of 84 ended a significant chapter in the history of railways in the country. The life and achievements of Late Eng. B.D. Rampala should be exemplified as an agent of sustainable change to the country in this modern era of advances from diverse disciplines and fields being integrated into more meaningful changes should therefore be taken in its spirit for the improvements to human well being it could bring which goal the great engineer strived for in his lifetime.